"Ty Coch Cottage" in Dihewyd near Aberaeron is a holiday cottage located on a working 200 acre farm. 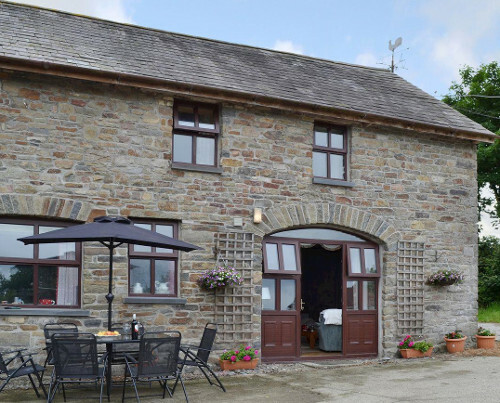 Ty Coch Cottage is attached to the owner's farmhouse, with the cottage sleeping 6 people. Ty Coch Cottage sleeps 6 people in 3 bedrooms, the bedrooms are made up of 2 doubles and a twin. Ty Coch Cottage has a TV in the living room, with Wi-Fi available so you can stay on-line during your holiday. The kitchen/dining room has an electric oven, electric hob, fridge/freezer and washing machine. The bathroom is also located on the ground floor. Ty Coch Cottage has bio-mass central heating, with your gas, electricity, bed linen and towels all included in the price of your holiday. Outside you have an area with outdoor furniture, and a shared enclosed lawned garden. There are 200-acres of farmland to explore. Pets are allowed to holiday with you at Ty Coch Cottage. Around the area you have the coastal town of Aberaeron about 7 miles from Ty Coch Cottage, where you can enjoy coastal walks - or try one of the pubs and restaurants in town. Aberystwyth is 20 miles up the coast, and the place to head for on a summer's day. It's also worth a visit to Strata Florida Abbey during your time at Ty Coch Cottage. Back at your cottage, you'll find the nearest pub and shop about 3½ miles from Ty Coch Cottage. Should Ty Coch Cottage not be to your liking, but you fancy staying in the area around Aberaeron, you might well be interested in the cottages below. All these cottages are within a few miles of Ty Coch Cottage.